Called White Mustard, this is an easy to grow salad with a peppery taste. 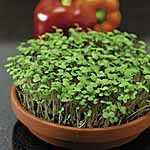 Perfect with cress, it's nutritious in salads and sandwiches. HEALTH BENEFITS: Good source of iron and vitamins. Ready to eat in just 1 week. Our community of gardeners have a wealth of experience, beautiful garden and great photos, discover more on the following pages: herb garden ideas, herbs.